Bananas and chocolate on the fire. In 2008 when I first tasted a chocolate filled banana cooked on a fire I was amazed at just how tasty it was. 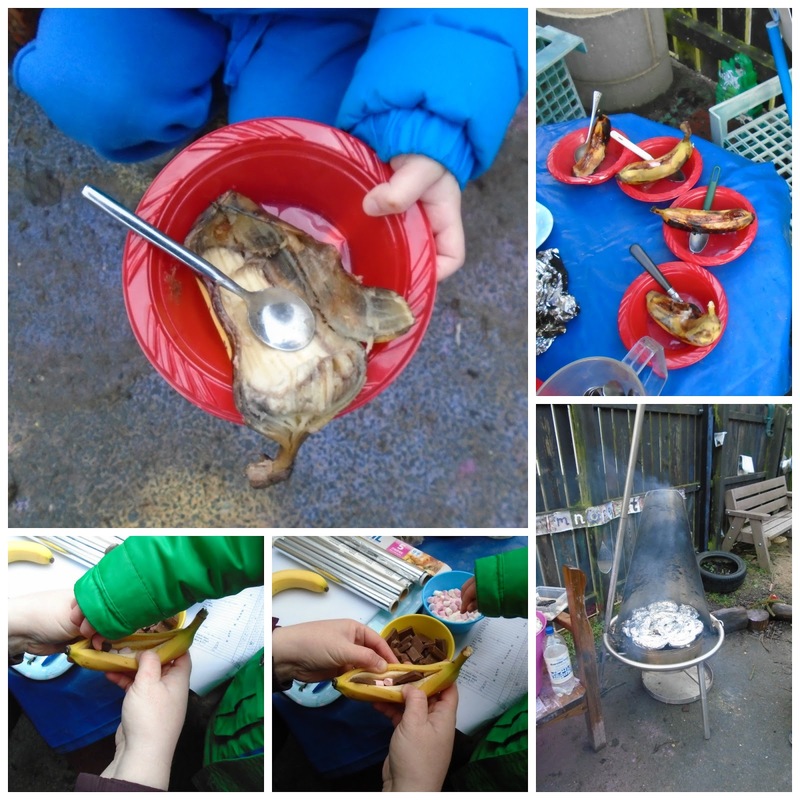 I hoped that some day I would be able to try cooking this with my nursery class & when we got our Haba outdoor fire it was one of the many things we attempted to cook with the class. 3 years on, it was time to introduce this culinary delight to a whole new class. They were allowed to put 2 squares of chocolate and 2 mini marshmallows into their banana - they all chose to put both into them. These don't take very long on a hot fire and after around 10-15 minutes they were ready to eat. In hindsight, the fact that most of the children don't eat bananas, it was ambitious to assume they would eat them this way - they all did try them, I think the lure of the chocolate tempted them but the majority didn't actually like them. However, 7 children and myself thoroughly enjoyed every bit of them! Not one scrap of banana left! I think we'll stick to toast & teacakes with this class - though we are going to try beans next week! 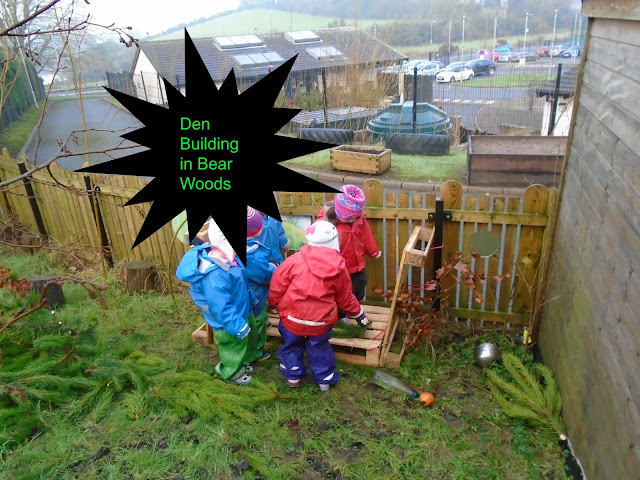 Den Building in Bear Woods. 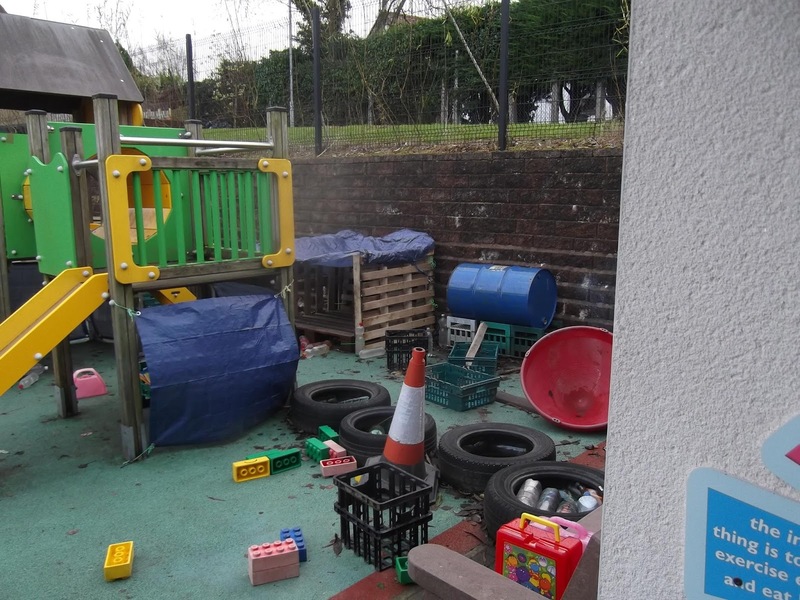 I have managed to gather up some pallets over the years and it is now a given that any arrive at the school are offered to the nursery before being disposed of! 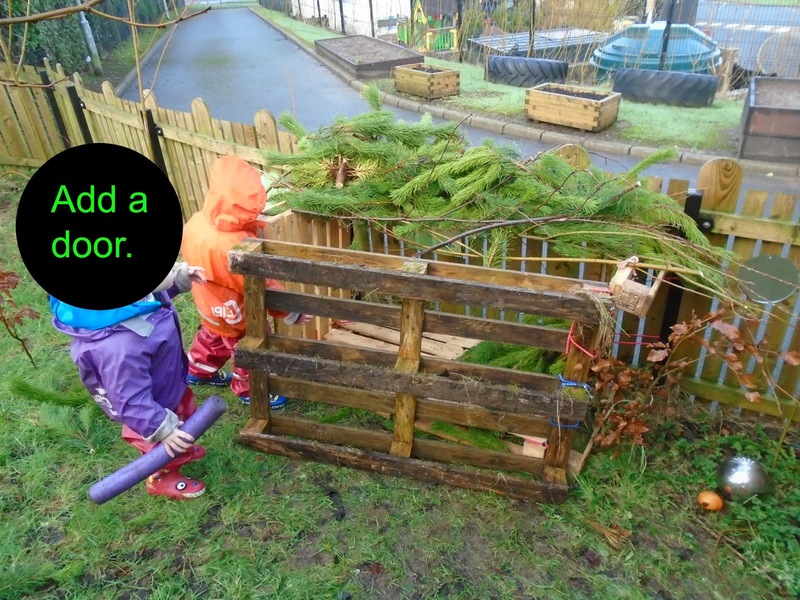 Last term I managed to make a little den in the playground form 4 pallets and the children use this on a regular basis during the play - it varies between being a stage, a bus or a house. This year, the class has been struggling with using Bear Woods - they just don't seem to 'get' it - in other years we have had to take very little with us, resource wise, the class have always just played in the space and instinctively invented games just for this space. This year, this particular class are just content to play in the playground, they don't relish the idea of leaving it and believe me they use every inch of space during their play. At the beginning of the new term we decided to add some new resources to the area to see if it would help enhance the play, we brought 4 pallets up and built a very rough mud kitchen, added a red top to gather water, some sauce pans and utensils & then left 3 pallets to make a den. Today was he first time since September that I saw the class really play in the space, some sent the whole time making grass soups & stews and we realised that we need some more 'ingredients' for the mud kitchen e.g. bark chips or stones etc. whilst others helped me build a simple den with the pallets and then they added a roof with some of the Christmas tree branches. It was lovely to see them make a pretend fire and have hot chocolate in their new house. Finally after 3 months I think we might be getting somewhere with this class and they may have begun to realise the potential of Bear Woods! Enjoying snow through fresh eyes. Ours were the only footprints in the vast playground. Sometimes it takes the young children in my class to make me appreciate the simple things in life, like snow. Like most adults I am not a huge fan of snow and I really think it's because we don't ever get enough of it to get used to it! If I think back to 2010 I finally learned how to drive in snow after 2-3 weeks of having to. In general for us adults snow is an inconvenience - it makes getting on with our every day lives a little bit harder than normal. However, if I am honest, since becoming a nursery teacher I have begun to look at snow differently - in fact probably all weather! When I wake up to snow on a school day, I get just as excited as a 3 year old and I can't wait to see the reaction of the children as they arrive. For many of the children in my class this was only the 2nd time they had had snow that they could remember - they all came in so happy & couldn't wait to get on their rain gear and go play with the sleighs & snow & ice around the playground. 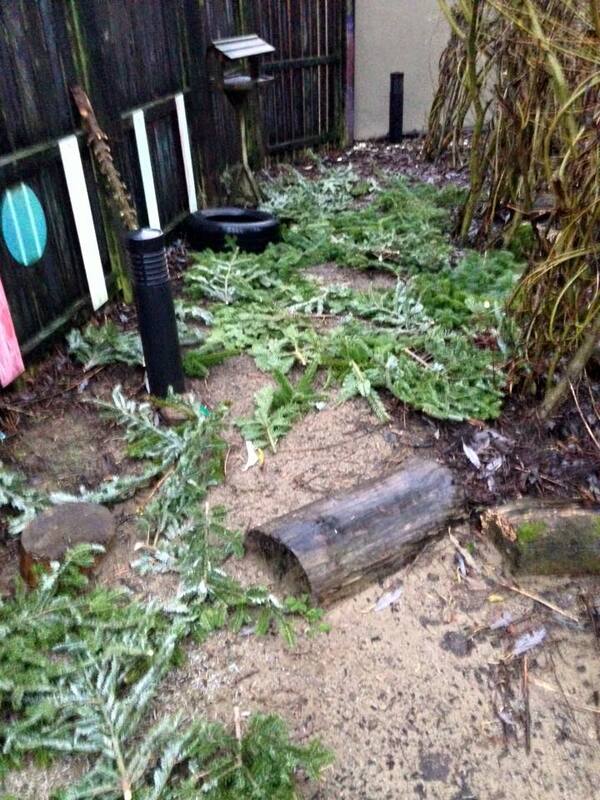 One child said today was all about smashing in the mud kitchen as he enjoyed breaking up all the ice. I was so impressed by how well this class managed at negotiating turns on the 4 sleighs, usually everyone wants to be pulled along but none wants to do the hard work of pulling! Could this be the beginnings of a castle built by the older children? We headed for a walk up to the main school playground, as I knew we'd one of the few classes to get out in the snow today. They children loved running around in the larger space, listening to the snow going crunch, crunch, crush underfoot & exploring the mud kitchen belonging to the older children. They also headed off into the wooded are to see if they could find Bear Woods. Who needs chalk when you have snow & fingers! I think I am so fortunate to get to see the world through the eyes of so many optimistic and enthusiastic young children. 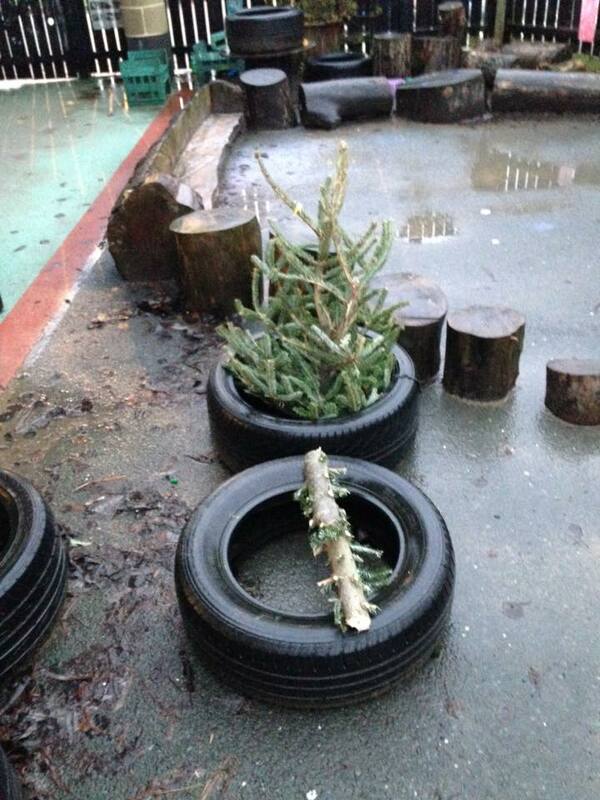 Christmas tree branches soaking up the mud! 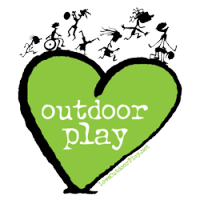 A few years ago we had a very wet Autumn and with constant use, the grass area in the playground turned to mud, it wasn't fun to use anymore as the children kept slipping over and getting plastered in mud every time they wanted to use this part of the space. In a social media group I was in, someone mentioned recycling old Christmas trees as a good 'floor' for a muddy forest area and so I decided to try this too. 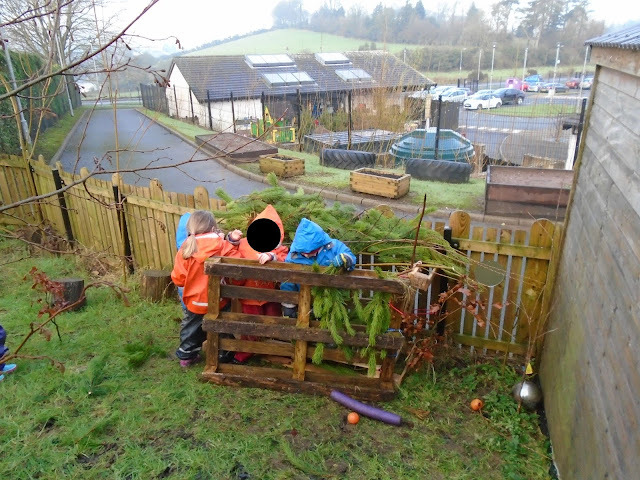 A parent who worked at the local recycling centre arrived one day with a load of cut up Christmas trees for us to spread around the grass muddy area. It worked brilliantly, the mud was soaked up and there was a gorgeous smell as the children trampled the branches into the ground. 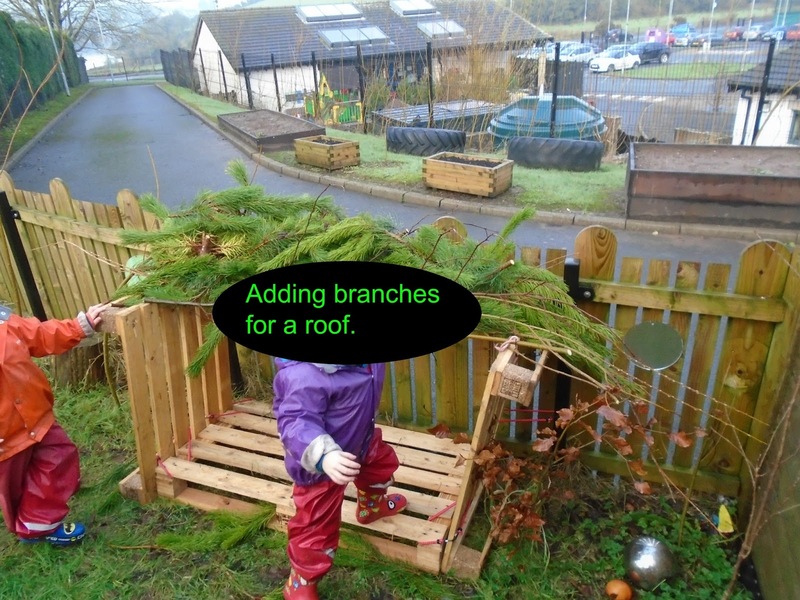 We also had instant loose parts, as the children incorporated the branches, cones & sticks into their play. 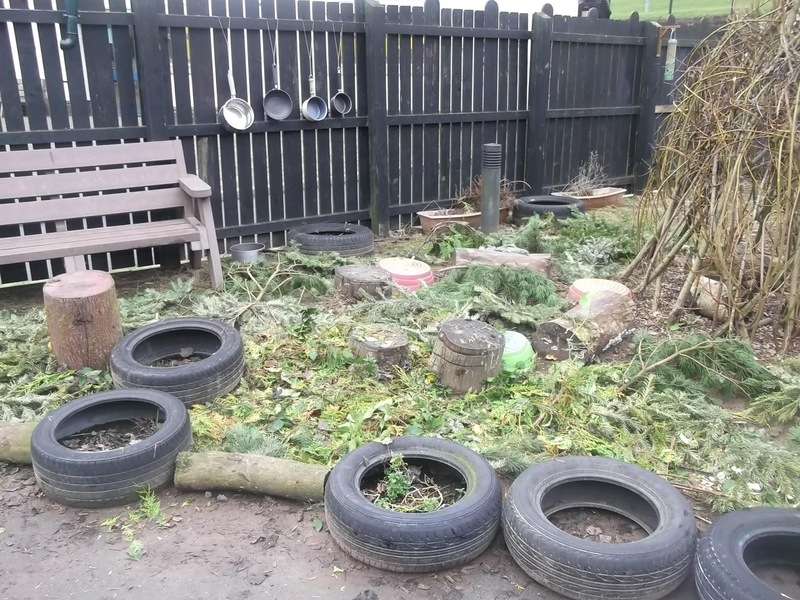 When the branches had lost their leaves we were left with a real forest feel to the area and now 3 years on, the children actually refer to it as the forest. Some days when the children are playing in there, it is hard to remember it is just a part of our playground and not an actual forest area! As our old forest 'floor' had begun to break down I put out an appeal for any old Christmas trees earlier this week & got three, one was already chopped up, I cut up the second but the third was the largest one - given to us by the Parent Council - as it brought over late in the day I just left it in the fire circle area and planned to cut it up the next morning. The children however had other ideas - as soon as they saw it they wanted to climb into it & water it! I chopped the top off and some of the taller branches but left the rest of the tree intact for several of them to enjoy playing with all morning. So much fun to be had 'riding' on a Christmas tree! 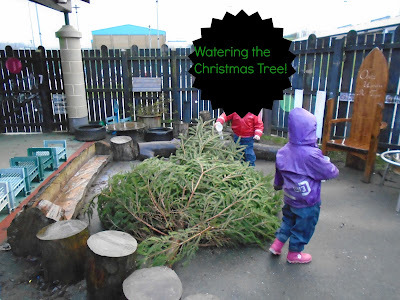 I had just cut off the top of the second tree and left it as a mini tree that the children could move about - it was funny to watch as it moved around the playground over the 4 days. The chopped up branches were used to make soups, stews and juice! 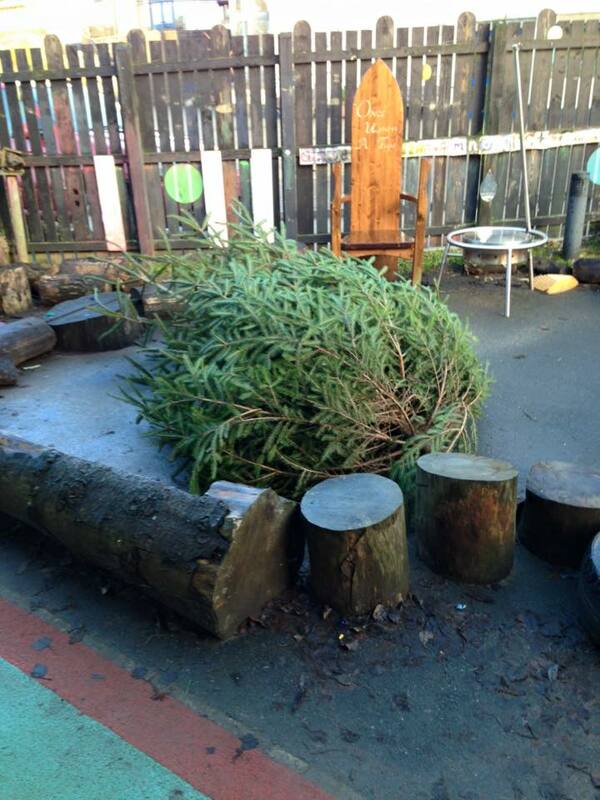 The plan is to cut the big tree up a bit more and take the branches up to Bear Woods to create some loose parts for den building, the children asked if it could stay in the fire circle until we need to move it to light the fire so I may leave the bulk of the tree in the forest area for the children to play around. 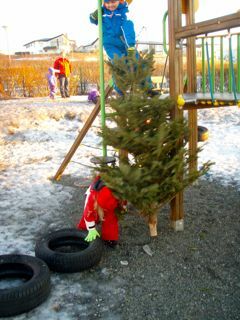 Icelandic fun with Christmas trees. You might also enjoy this wonderful guest post that Unnur Henrys did over on Takoma Park Cooperative Nursery School's blog on what the children in her Icelandic preschool got up to with their old Christmas trees. 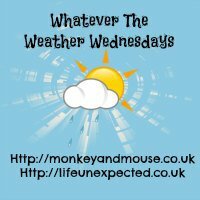 I've linked this post up to Life Unexpected's Whatever the Weather Wednesday link - pop over to see lots more inspiring outdoor ideas. The children came back after two weeks off and I was delighted that they all came happily into nursery and settled easily back into routine - I always worry a little the night before that they won't!! However, I should know better, they were all glad to see their friends again and enjoy playing outside and it really did seems as if it it was just like an ordinary Monday after any weekend. It was, however, quite dark and wet but they just grabbed their torches and made the most of their playtime. I had asked for old Christmas trees to be donated to the nursery and managed to get two already, the branches were strewn around the forest area of the playground to replenish the old branches and bark chips. After two weeks of constant rain the mud kitchen was full of water, every bowl and pot or pan and the sink were overflowing. Several children couldn't wait to get into the rain clothes and head over there to start 'cooking'. One girl added some Christmas tree branches and leaves to make 'Christmas juice' - I must say the smell was delicious! On mornings like this, it is hard to find a better job - sitting in the rain on a tree stump being served Christmas juice or spaghetti (water with willow leaves)! The tree branches prove more loose parts for play as one child used the top of one the trees as a whisk to make her soup! Inside, meanwhile, we had water beads in the water tray for endless hours of fun - it is so magical to watch the clear ones 'disappear' in the water and the children were very careful not to let them bounce over the floor too much. They decided they were slippy, slimy, soft and like jelly. 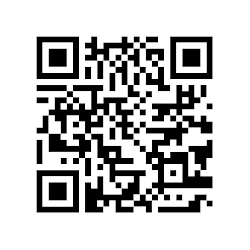 I can't wait to see what adventures we will have in term 2.